Massive day today – smashed out 40 big ones! Staying in Ringiriri meant an early start for me this morning. I was out the door just after 6am ready to hit the highway to hitch to Hunley (I haven’t included this hitch in the distance travelled today), expecting to catch a ride with people going to work. The problem is I don’t really know what day it is at the moment and after waiting for a while I realised it was Saturday and there would not be a huge amount of traffic. I hung around the outside of the pub waiting for local traffic heading south but not much really came through and those that did, didn’t feel like giving me a ride – fair enough, I wouldn’t either. After a half hour the motor way construction crew started arriving for work. One of them came over and said there won’t be much traffic through and I’d have better luck if I walk the 1km or so around the construction area onto the SH1. He was right. Within five minutes of waiting on the highway at a suitable location for cars to pull off I had a ride from a Kiwi fella off to visit his grandkids for the weekend. Perfect. I was able to make Huntly by 7am and hit up a bakery for some lunch for the day. From Huntly central it was an hours walk to the start of the Hakarimata Range and a walkway that would take me to Ngaruawahia. What an introduction to the day. The start of the trail starts with stairs. And more stairs, and more. Straight up from about 10 metres elevation to over 300 over a one kilometre distance. The morning was a bit drizzly to start with but I didn’t really have to worry about that as I was drenched before reaching the top of the stairs. The track was particularly well constructed, well benched and gravelled but only up until a viewing platform. The views were good but a little overcast. On a clear day you would be able to see a long way. From the viewing area the track naturally turned to tramping standard for the next 7 km across the spine of the Hakarimata Range. 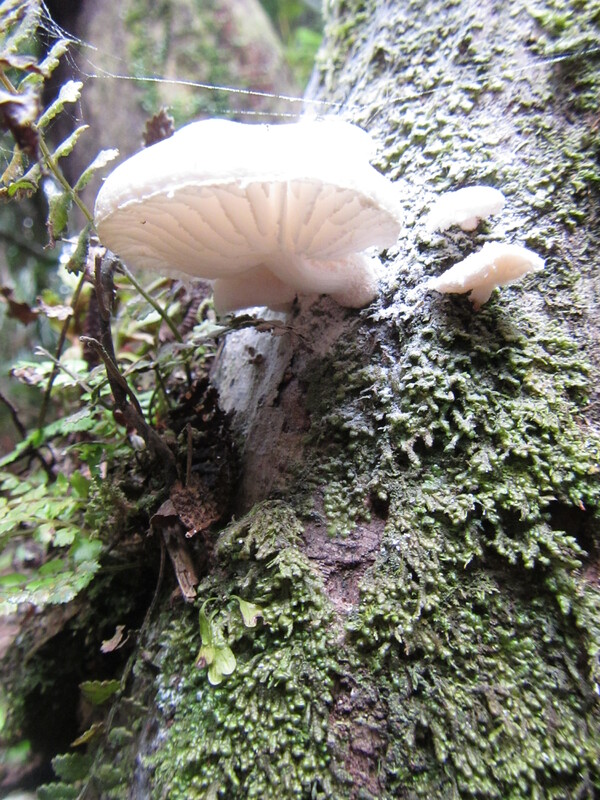 But it wasn’t too bad for tramping standard. The notice board at the start of the hike claimed it would take 7 hours to complete but I think this meant for weekend warriors or standard run of the mill family day walkers. The recommended time does not account for super tramps who have covered over 700km. It took me just over 4 hours to the highest point and viewing platform at the southern end of the range. The trail was constantly chaning righ through the day from well formed sections to roots and the odd muddy patch. Across the range the vegetation and trees changed as well. 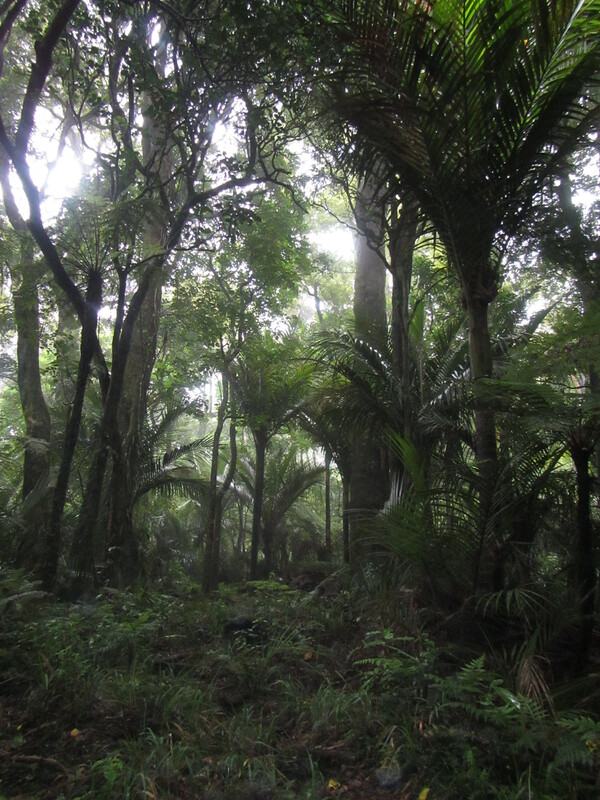 I reckon the best bits of trail were through canopy dominated by huge tree ferns. These sections made for soft footing underneath with no roots. 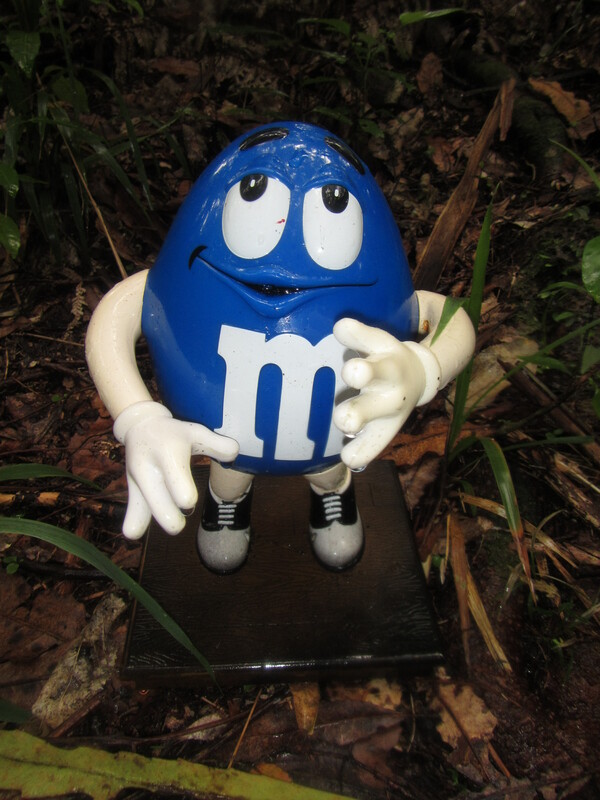 Around halfway I came across a little friend in the forest Blue M&M. A geocache in the middle of no-where. On crossing the range, the weather had improved a bit, not quite full sun but the drizzle had gone. 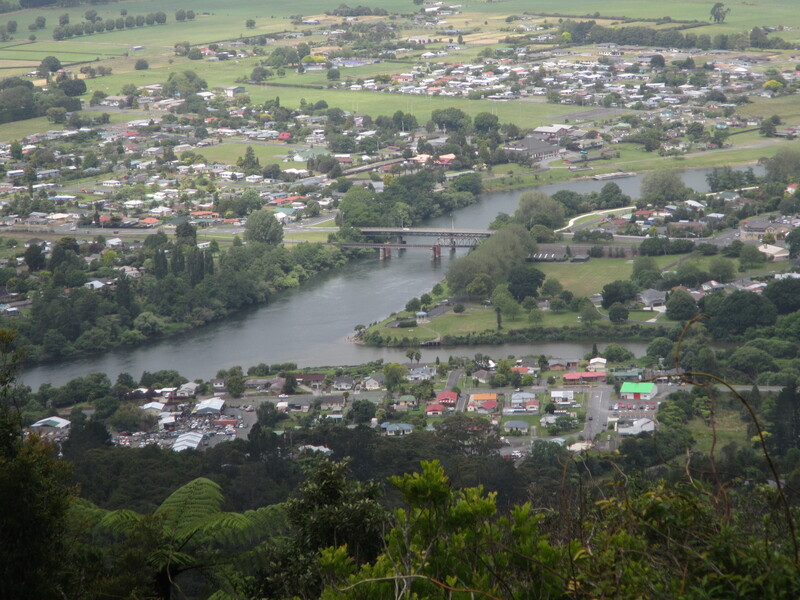 This made for OK views out over Ngaruawahia town. One thing I could imagine was the number of people climbing to the viewing platform from the town. Obviously a very, very popular training run for all the towns folk. But that’s all good as I got my fix of eye candy with all the young women in their active wear. I got talking to a few people from the top as everyone was commenting on me carrying a pack. They thought I had climbed from the stairs from where they had started and thought I was made, but thought I was madder when I told them what I was undertaking. 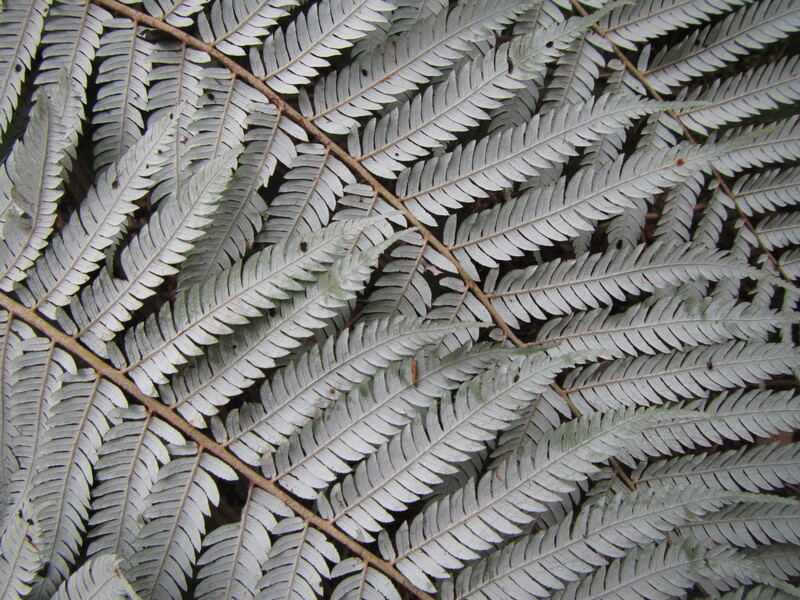 Surprising many had never heard of Te Araroa, despite the trail signs stating that this section of the walk was part of the long pathway. It also got me thinking that the section down to the town is obviously littered with stairs and is quite steep. It was. Probably more stairs here than there were down to Peach Cove. Really well constructed and nicley spaced stairs so I fell down, planting tramping poles on the lower steps to save my knees. The climb down was similar to the climb up only quicker. From the bottom it was a short walk into town for a cold coke and sugar hit. The remainder of the day was long and uneventful really, along main roads including a 5km section of SH1, through a golf course ( oh how good was the grass to walk on), and constructed walking-cycling way to Hamilton. Towards the end I was zonked and just needed to get the day over with. 40kms is too much. Headphones in with my favourite pumped up music, feet pounding and everything hurting I made it Hamilton. One of the aims for this trip was to do a 50km day but I honestly don’t think it cane be done with a heacy pack – maybe it is possible by slackpacking and on roads, but not with a pack or on off road sections.